European integration has been most successful at a legal level and European influences have left an indelible mark on English and United Kingdom Public Law. These influences must be fully understood by students, academics and practitioners if they are to understand our public law and its future direction. To fail to appreciate the European context in which our domestic law is developing is to fail to comprehend our public law. This completely revised book, which was first published in 2003, examines the debate surrounding the influence of European Union and European Convention law, as well as the influence of national laws on the public law of the United Kingdom in a thematic and analytical manner. The book examines what influence the common law has extended on other European legal systems. The book seeks to unravel the mutual influence brought about by closer legal integration within the European experience at supra-national, national and sub-national levels. This book will prove to be an invaluable guide to the ever developing European context of our domestic public law. 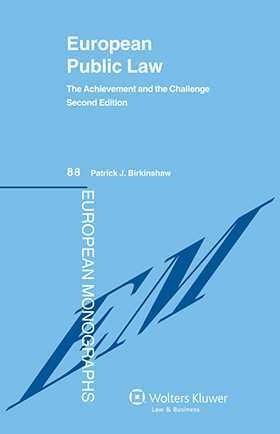 This new edition comes at a time of growing political disenchantment with European integration, at a time when the Union is growing in size and diversity and at a time when failure in consensus has led to non-Union measures for member states. Nonetheless, Europe has profoundly influenced our national legal development and that development must be understood. Patrick Birkinshaw is a Professor of Public Law and the Director of the Institute of European Public Law at the University of Hull. Since 1994 he has been Editor in Chief of the journal European Public Law (published by Kluwer Law International). He has been a contributor and adviser to various House of Commons and House of Lords Select Committees on European and domestic legal subjects. He is the author most recently of Freedom of Information: the Law, the Practice and the Ideal (4th edition (2010)), Government and Information: The Law Relating to Access, Disclosure and their Regulation (4th edition (2011) with Mike Varney) and The European Union Legal Order after Lisbon ((2010) edited with Mike Varney). Part I Some Basic Issues. Chapter 1 Setting the Context for European Public Law. Chapter 2 Law and Government: A Comparative Tour. Chapter 3 The Union and National Systems and Their Contribution to European Public Law. Chapter 4 The Main Features of UK Constitutional Law and European Integration. Part II Some Key Issues. Chapter 5 ‘An Ever Closer Union … In Which Decisions Are Taken … as Closely as Possible to the Citizen’ – Subsidiarity and Devolution. Chapter 6 ‘…As Openly as Possible…’: Transparency, Openness and Access to Information. Chapter 7 National Participation in Union Affairs: Democracy, the UK Parliament, Devolved Parliaments and the EU. Chapter 8 Principles of Review. Chapter 9 Citizenship and Protection of Human Rights. Chapter 10 Public Liability: European Influence and Domestic Change. Chapter 11 The EU Ombudsman, Complaints and Internal Complaints and Grievance Procedures. Chapter 12 Competition, Regulation, Public Service and the Market. Part III Some Problems and Future Issues.